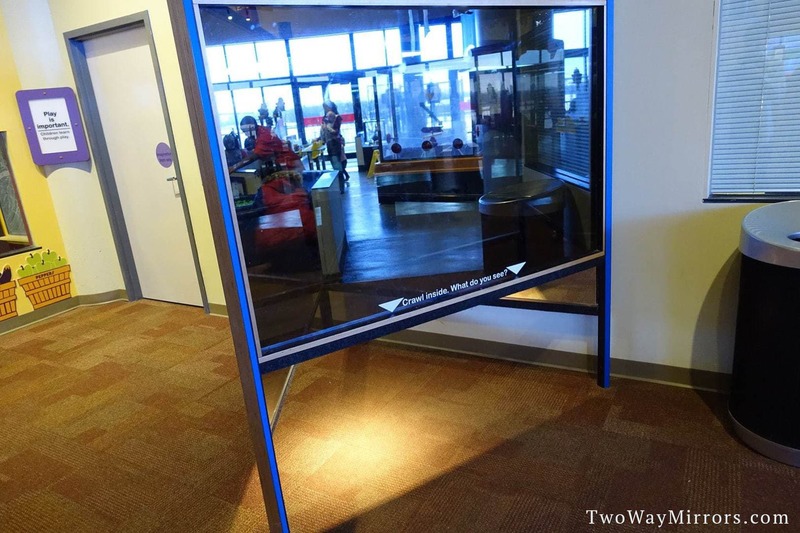 A two way mirror, also known as a one way mirror, is transparent on one side and reflective on the other. 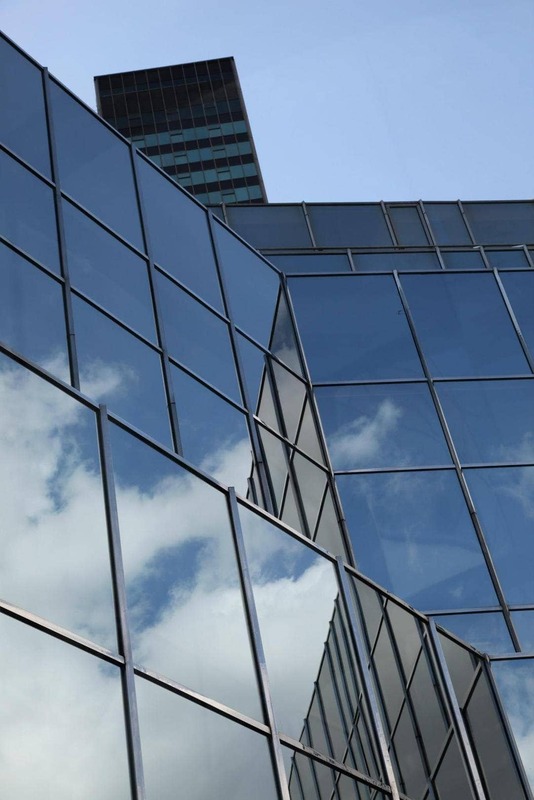 A durable coating is created by permanently baking a thin layer of aluminum on gray-tinted glass. What is a Glass Two Way Mirror? A glass two way mirror, also known as a one way mirror, is a semi-transparent mirror that is traditionally made for privacy and security purposes. It is made on a grey glass substrate and the mirror coating is baked on during the manufacturing process. To increase privacy even more so with this mirror, you can apply dark tinted film to the back side when the lighting conditions are not as favorable. For the two way effect to work, the light ratio needs to be at least 1:2, and optimally 1:6 so it is no longer see-through. If the lighting is the same on both sides, it will not be 100% private. If you are in need of an observation mirror that is better for recording through, see the acrylic two way mirror or glass smart mirror products that have a higher transparency which means better picture quality. The appearance of a glass two way mirror depends on which side you are looking through–it is only reflective from one side. With lighting darker on the observation side, the observer is able to see straight through it, but from the other side all you see is a regular mirror. We can temper the glass to increase its strength by tenfold. The glass is rated for both indoor and outdoor use and has a highly durable coating which can be cleaned with standard glass cleaner and paper towels. 1 side reflective, other side is transparent. Temperable to increase its strength by 10x. Durable coating can be with standard glass cleaner. 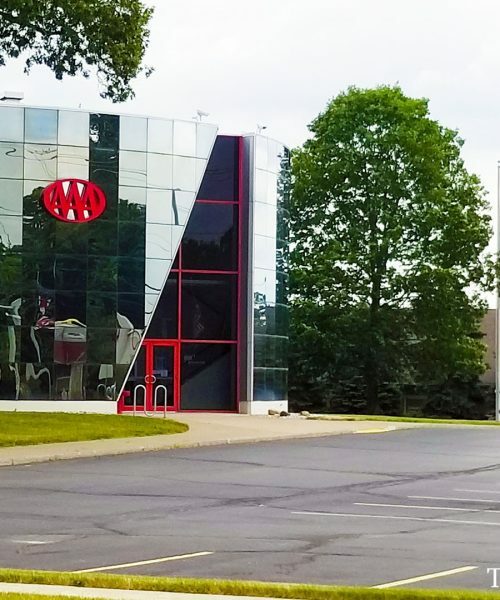 Add window tint to non-reflective side to increase privacy. The easiest way to test the lighting with just a small piece is to cut a hole in a large piece of cardboard and place the sample over the hole. This will allow you to judge the reflective properties in a larger area. If you need a thinner two way mirror, consider the 1/8″ glass smart mirror, or 1/8″ acrylic two way mirror. Tempered glass is heat-treated to increase the strength 10x. In addition, if tempered glass should break, it breaks into small shards which are less sharp than regular glass. 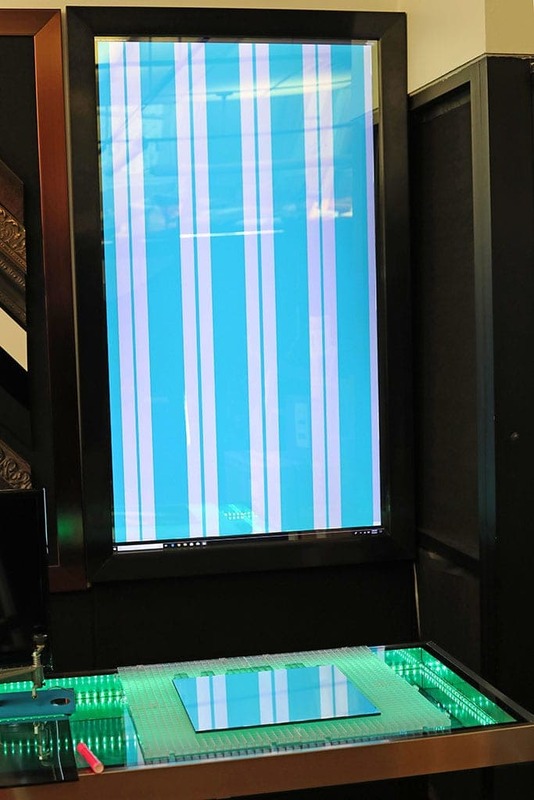 The main disadvantage of tempered glass is that it causes distortion, similar to a fun-house mirror effect. For that reason, it’s generally not recommended unless going in a public installation. In the image below you can see the visual distortion it has along the 1″ perimeter of the mirror. We took the image by having a screen show striped lines and angled the camera so the mirror is reflecting these lines on its surface. The display setup is shown below as well. How do you know if it is a two way mirror? You can conduct a fingernail test to find out if it is a glass two way mirror. Start by placing your fingernail to the glass. If there is NO GAP between your finger and its reflection, it is likely a two way mirror. Acrylic 2 Way Mirrors and Glass Smart Mirrors have a gap so this test will not work. 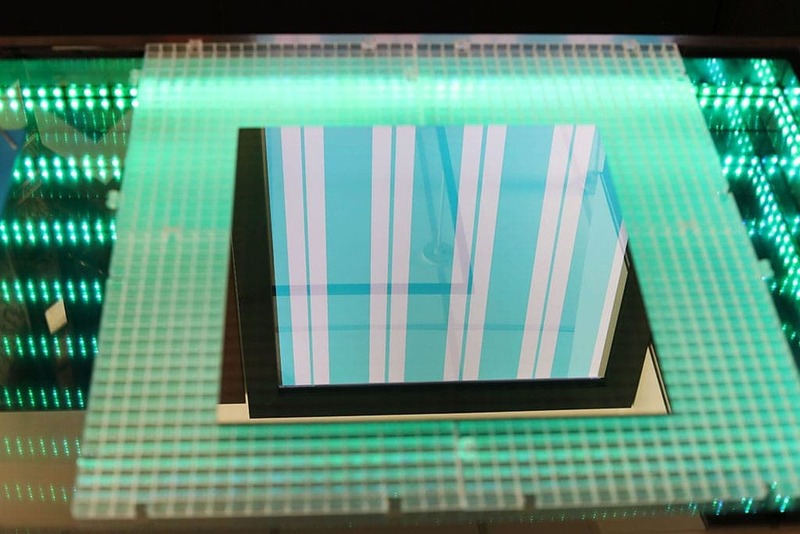 How does 1 way glass work? One-way mirrors are the same as two-way mirrors. 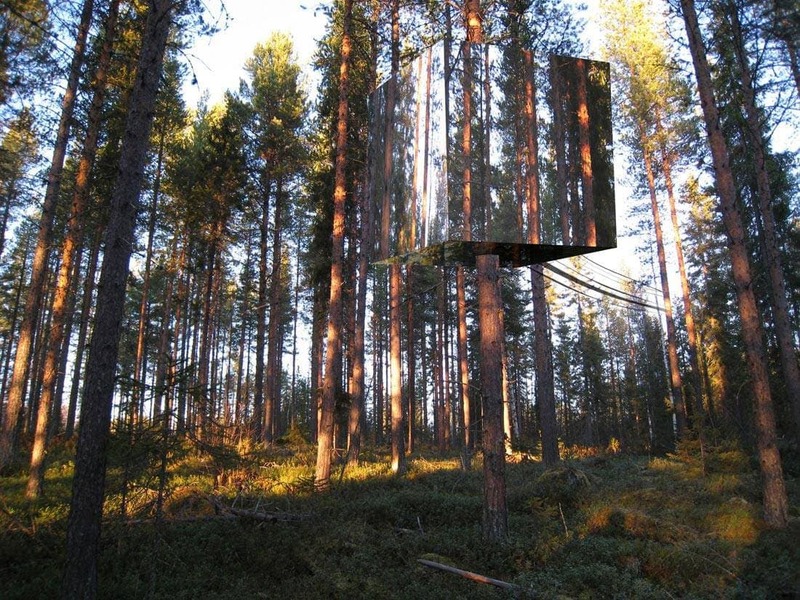 It has a semi-transparent mirror coating so it is see through and reflective at the same time! How it looks depends on the lighting on either side of the mirror. Keep the “backside” dark and the mirror side bright to turn it into a mirror. 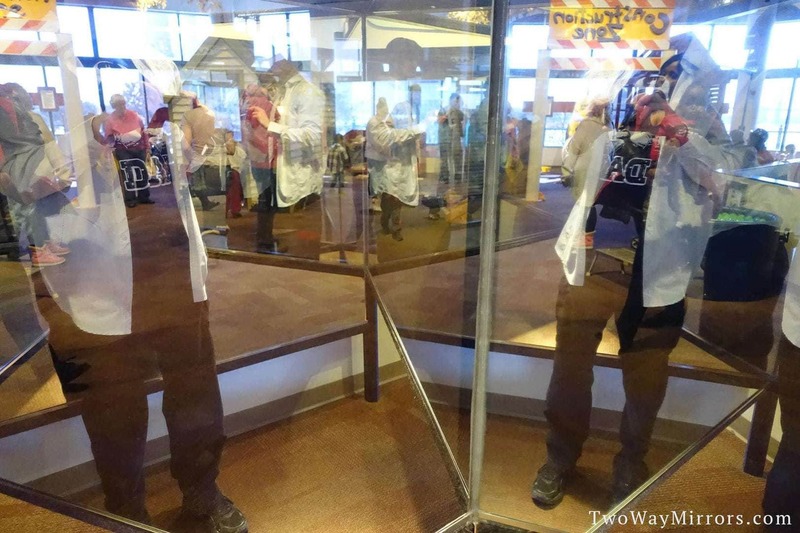 What is a 2 way mirror? A two-way mirror is also known as a one-way mirror. When you hold the mirror up in the air, it is see through. When you make the back side dark and the front side bright… it turns into a mirror. This is because it has a semi-reflective/semi-transparent mirror coating on a gray glass substrate. Is it one way mirror or two way mirror? A one way mirror is also called a two way mirror. Both terms describe the same type of mirror. To create the one way mirror illusion you must work the lighting. You must make one side dark and the mirror side bright for it to look like it is not transparent. Which way is the Glass Two Way Mirror installed? The glass two way mirror we provide is one-directional. You must install it with the mirror coating facing the brighter (subject) side to work. This is because the two way mirror coating is on a gray glass substrate. If you want something two-directional, see the acrylic two way or glass smart mirror. How do I install a two way mirror? You can install a two way mirror just like you would a regular mirror or window, depending on the type of installation. 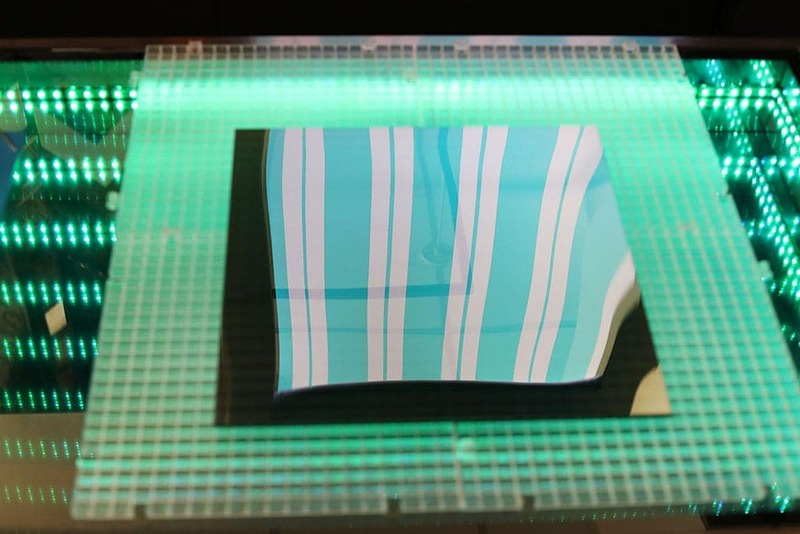 Can you manufacture sound proof two way mirrors? Yes, we offer 1″ insulated sound proof glass. Please contact us with the size and quantity you need and we can send you a price quote. Can you manufacture bullet resistant (ballistic) two way mirrors? Yes, we are able to laminate the two way mirror to other layers which offers bullet resistance. Minimum thickness is 1 3/16″ for the lowest level of protection which you can order directly online here. For higher levels of security, please contact us with your specifications and we will send over a quote via email. What is the difference between sanded and polished edges? We sand all the edges to prevent cutting, which is also referred to as “seaming” glass. A polished edge using increasingly fine belts until the edges are smooth. 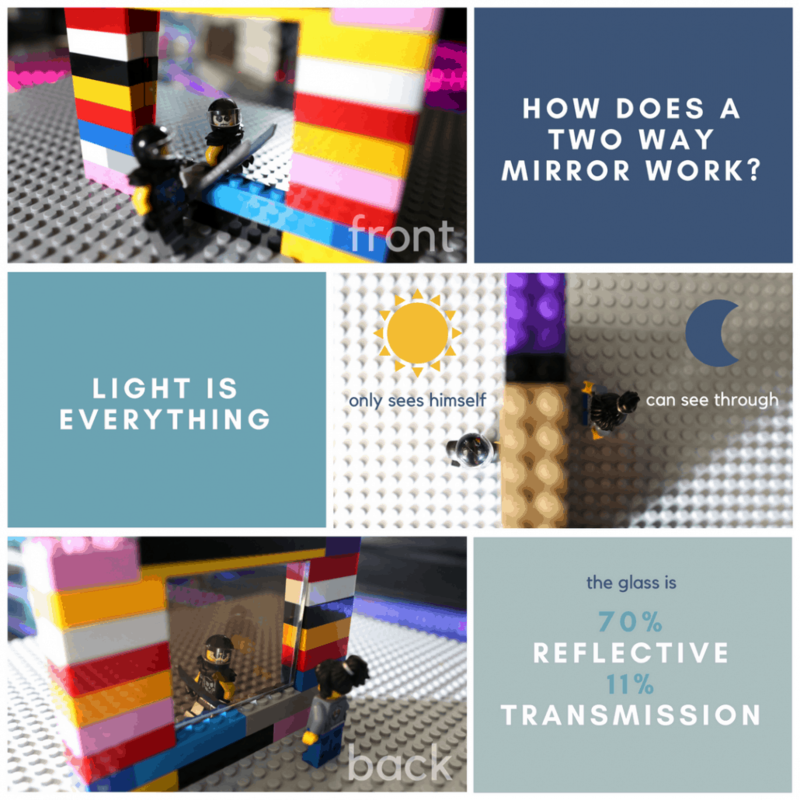 Can you make clear two way mirrors? Yes, we sell clear two way mirrors, also known as “military grade” two way mirrors on our smart mirror page. Our acrylic two way mirrors are also clear. What is the best tool to cut glass two way mirrors? 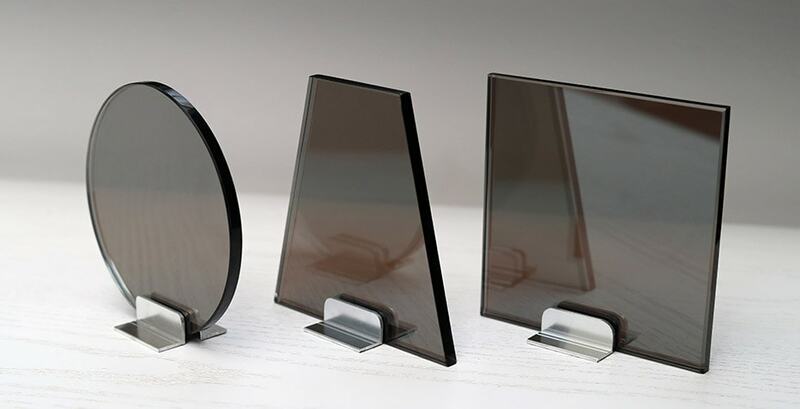 With non-tempered mirrors, the score-and-break method is used with a glass cutting wheel, just like regular glass. 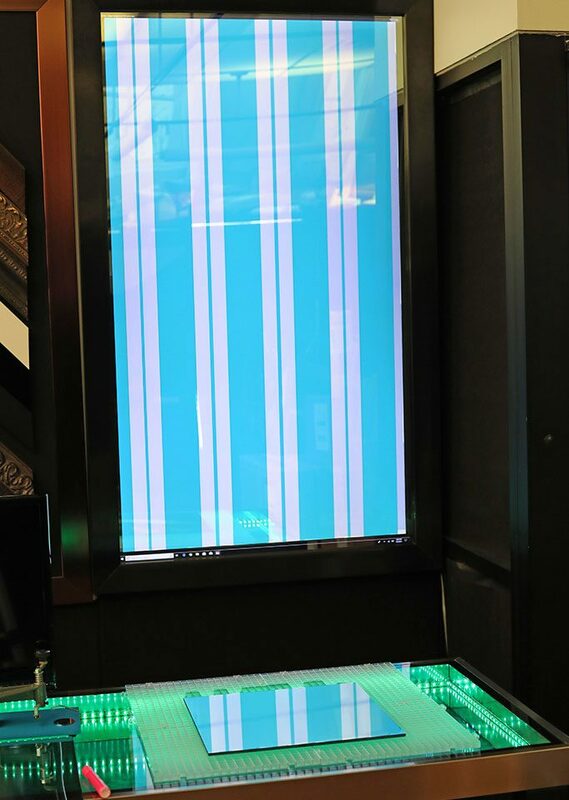 Tempered glass can’t be cut. Check out our ultimate cutting tool guide with tips and tricks here. What is the difference between a two way mirror, tv mirror and smart mirror? A glass two way mirror is extremely dark, preventing people from seeing through it. Our other products are more transparent, to allow better viewing quality to the display. Can you cut different shapes or drill holes? We offer full fabrication services, please contact us with the size, quantity, and diagram in JPG or PDF format for a quote. We are standing by to cut and package your mirror immediately. Untempered glass is typically shipped within 1 day, tempered glass takes about 1 week. Can you laminate the glass two way mirror? Yes, we can laminate the two way mirrors to clear glass to enhance safety. Please feel free to contact us for a quote. How strong is the Glass Two Way Mirror? Our glass is exactly the same strength as regular glass. 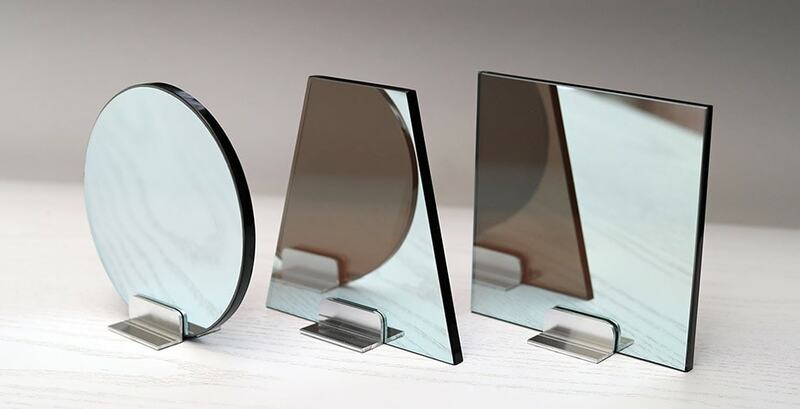 If you need a high level of strength, the 1/4″ thick acrylic mirrors can easily withstand a high-speed impact from a blunt object such as a hammer. The glass is brittle unless you get it tempered, which increases the strength by 10x. What glue should I use with the Glass Two Way Mirror? For glass we recommend UV glue or CRL black mirror mastic. We recommend you practice first on a sample piece to make sure you are satisfied with the effect before trying it on larger mirrors. How do I figure out which is the mirror side of the glass two way mirror? How likely is it that my mirrors will break in shipping? It’s very unlikely that our mirrors will break in transit. Our mirrors are fully insured and packaged in custom boxes and wrapped in strong, flexible packing materials to ensure that they’re well-protected during transit. If they should arrive broken, send us a picture of the broken glass and the outside of the box, and we will send replacements right away. 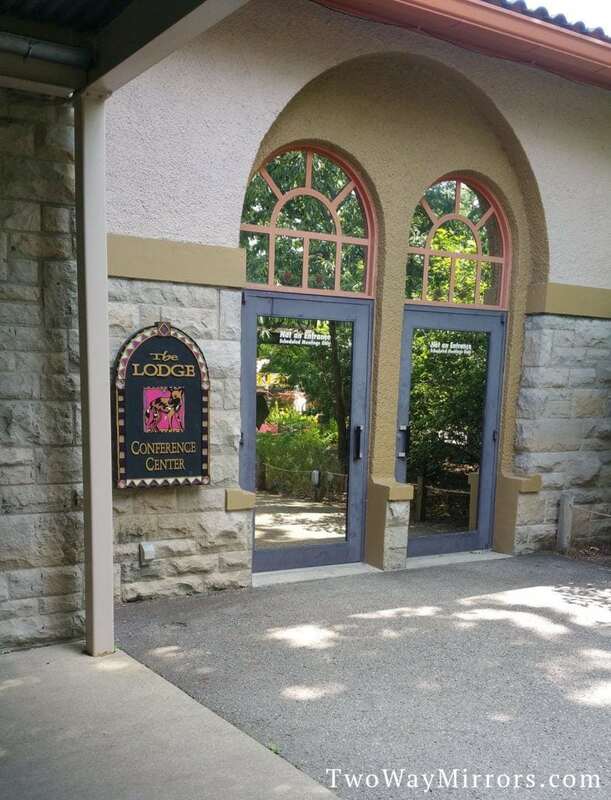 Can the mirrors be used outside? The glass mirrors work great outside and as windows. 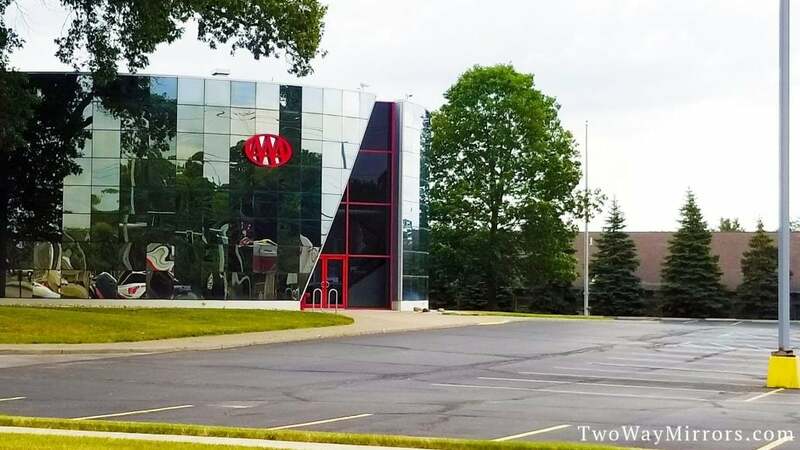 The acrylic mirrors don’t work outside because moisture damages the coating. What should I use to clean the surface of the mirror? The coating of the glass is extremely durable and can be cleaned with any standard glass cleaner such as Windex and paper towels. How can I make my own two way mirror? It is advisable to purchase it premade from us to avoid handling silver nitrate, a dangerous chemical. If you attempt to make them on your own, be sure to wear protective gear to avoid exposure to it. The best way to turn clear glass into a two way mirror is to use the Two Way Mirror Film. Can you use two way mirrors in a shower to increase privacy? Glass two way mirrors work great in a shower. You’ll want to make sure you order tempered glass or even tempered laminated for enhanced safety. If you send us a diagram including any holes you want drilled, we can send a custom quote.